A investigation into artistic authority, appropriation, legacy and copyright through a biography of the Chicago nanny who wandered the city for decades, constantly snapping photographs, which were unseen until they were discovered in a seemingly abandoned storage locker, after which she was heralded, posthumously, as one of the 20th century's greatest street photographers. ...an exhaustively researched and engrossingly written examination of the life and work of the enormously talented and intensely private American photographer ... 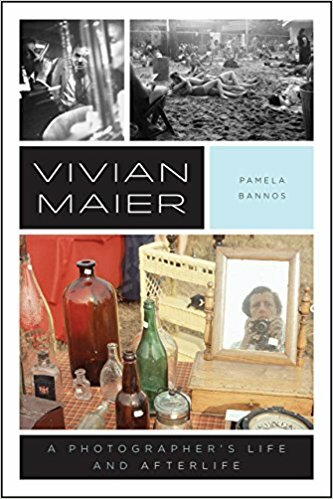 Throughout the book, Bannos gives a thorough account of how 'mansplaining Vivian Maier contributed to her mythologizing.' In turn, she provides a much-needed alternative to these largely reductive and romanticized myths ... As her subtitle suggests, Bannos deftly weaves Maier's chronological biography with the afterlife of the work she left behind. This multilayered structure results in a fascinating and balanced look at questions of artistic authority, appropriation, legacy and copyright ... By the end of this impressively documented and nuanced page-turner, Maier will no longer be a mystery woman to the reader either. Instead, a much richer and more valuable portrait emerges: that of a gifted and methodical artist and a multifarious human being. ...[an] assiduously researched and riveting biography ... Bannos tacks between fully chronicling Maier’s fiercely independent and creatively intrepid life and thoroughly investigating the sale of her photographs and the questions raised about who has the right to profit from them ... aking measure of the barriers women face, Bannos portrays Maier as nothing less than a consummate, prolific, world-traveling, uncompromising, and fearless artist. ...almost point by point, Bannos refutes how Maier has been marketed. And she looks at how it has benefited Maloof et al. to present Maier as a strange, incapable wraith, how it made them look all the more heroic, and allowed them to cavalierly overlook her absolute unwillingness to show her work publicly ... The achievement of Bannos’s intelligent, irritable self-reflexive study is in its restraint. She unseats the ghost and restores to us the woman — but in her own words and images, and without psychologizing. It’s a portrait as direct as any of Maier’s, and what a distinct pleasure it is to meet her gaze again. What did you think of Vivian Maier: A Photographer’s Life and Afterlife?